The exhibition New Ground: The Southwest of Maria Martinez and Laura Gilpin explores how potter Maria Martinez (ca. 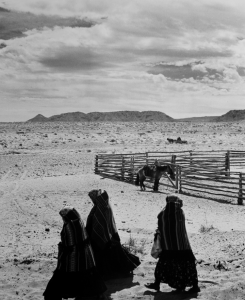 1887–1980) and photographer Laura Gilpin (1891–1979) brought the American Southwest into focus as a culturally rich region that fostered artistic expression. Martinez and Gilpin were friends in New Mexico over many decades. The artworks in this exhibition overlap in content and display to underscore the artists’ relationship with each other, which transcended boundaries of place and culture. Left to right: Laura Gilpin, Maria Martinez Making Pottery, 1959; Gelatin silver print, 10 ¾ x 14 ½ in. ; Eugene B. Adkins Collection at Philbrook Museum of Art, Tulsa, and Fred Jones Jr. Museum of Art, University of Oklahoma, Norman; and Fred E. Mang, Jr., Laura Gilpin taking photographs along dirt road, 1971; Reproduction of gelatin silver print; Amon Carter Museum of American Art, Fort Worth, Texas, Gift of the artist and Laura Gilpin P1979.98; ©1971 Fred E. Mang, Jr.
Gilpin first got to know Martinez and other Pueblo and Navajo people through her lifelong companion, Betsy Forster. In 1930, Forster and Gilpin moved from Colorado to New Mexico, where Gilpin planned to photograph the rugged terrain. Forster became a field nurse with the New Mexico Association on Indian Affairs, a position through which she—and Gilpin—became intimately connected to the local population. Laura Gilpin frequently photographed artists in the process of creating rugs, jewelry, and pottery. 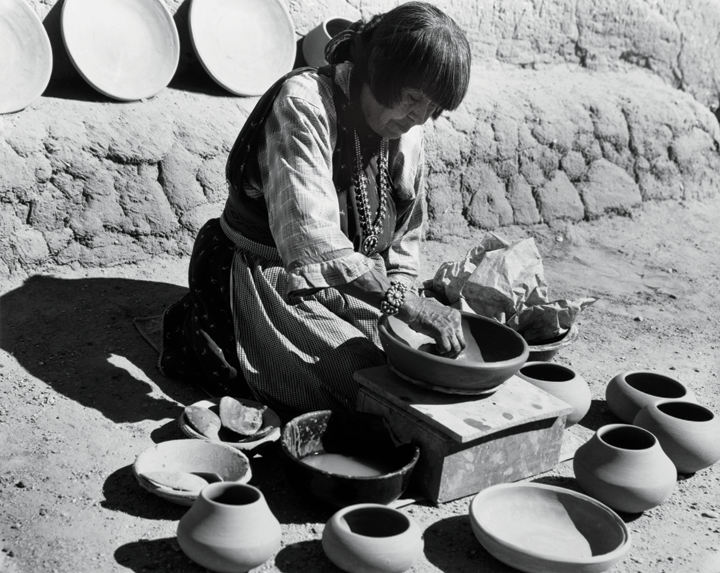 Over the years, Gilpin photographed Maria Martinez and her family during the many stages of making pottery, from processing raw clay to shaping bowls and jars, painting decoration, and even firing the pieces. Gilpin never photographed anyone without their permission, and she frequently formed relationships with her subjects. Her documentary prints are intimate portraits that capture the personalities and detailed features of her individual sitters. For Maria Martinez, relationships with family, community members, friends, and people from the art world were a guiding force throughout her life. She learned pottery-making techniques from an aunt, and later added new methods as she collaborated with her husband and other family members. She collaborated with her husband, Julian, until his death in 1943, but she also worked with her sons—particularly Popovi Da—as well as daughters-in-law, and her grandson Tony Da, who was Popovi’s son. She also shared these processes with others, demonstrating her unique form of artwork in her home community and at art shows and expositions around the country. 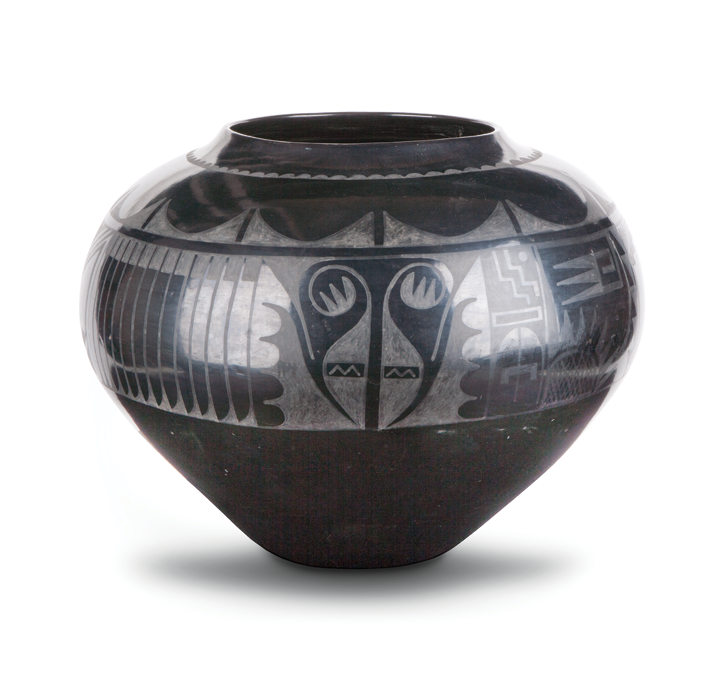 These collaborations cemented her legacy and lasting influence on Pueblo pottery. Visit the museum and explore New Ground, on view through May 14, 2017. Adapted from text by Virginia Treanor, associate curator at the National Museum of Women in the Arts, Christina Burke, curator of Native and non-Western art at the Philbrook Museum of Art, and Catherine Whitney, chief curator at the Philbrook Museum of Art. Contemporaries and friends, potter Maria Martinez (ca. 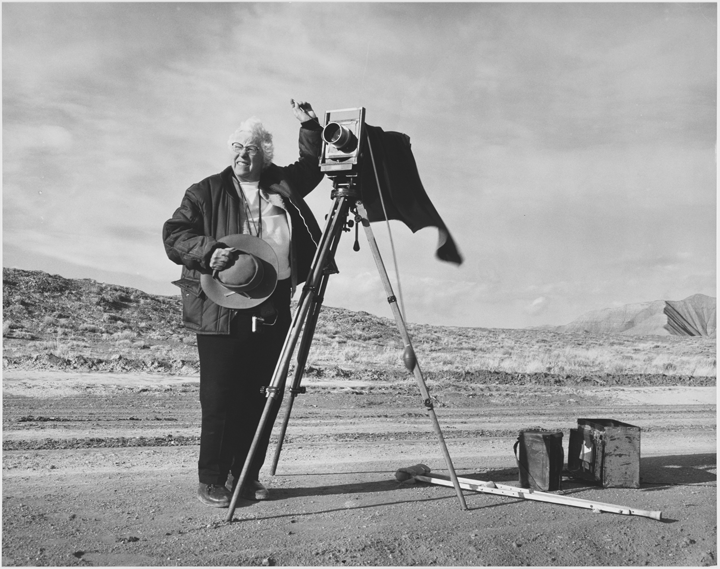 1887–1980) and photographer Laura Gilpin (1891–1979) brought the American Southwest into focus as a culturally rich region that fostered artistic expression. The exhibition New Ground: The Southwest of Maria Martinez and Laura Gilpin pairs 26 ceramic pieces by Martinez and her family with more than 40 vintage photographs by Gilpin. Fred E. Mang, Jr., Laura Gilpin taking photographs along dirt road, 1971; Amon Carter Museum of American Art, Fort Worth, Texas, Gift of the artist and Laura Gilpin, © 1971 Fred E. Mang, Jr. Described during her lifetime as the “grand dame of American photography,” Laura Gilpin’s career spanned more than six decades. Throughout her career, she deftly used her chosen medium, black-and-white photography, to accentuate both the grand expanses of the Western landscape as well as the individual faces of the Native people who lived there. Through her elegant photographs, she emerged as a celebrated chronicler of the cultural geography of the American Southwest. Born in Colorado, Gilpin attended a Connecticut preparatory school to study music and later the Clarence H. White School of Photography in New York. Her earliest prints were soft-focused, romantic images that reflected Pictorialism, a popular movement in turn-of-the-century photography that sought to promote the medium as an art form. As photography advanced in the early decades of the 20th century, Gilpin turned away from the Pictorialist-inspired images she had been making and instead began taking “straight photographs,” images in crisp focus and with high contrast. Gilpin considered herself a landscape photographer, but her images chronicling people and their activities are perhaps her most distinctive work. Like other photographers documenting the American scene during the 1920s and ’30s, Gilpin’s portraits capture humanity and changing conditions in rural America. 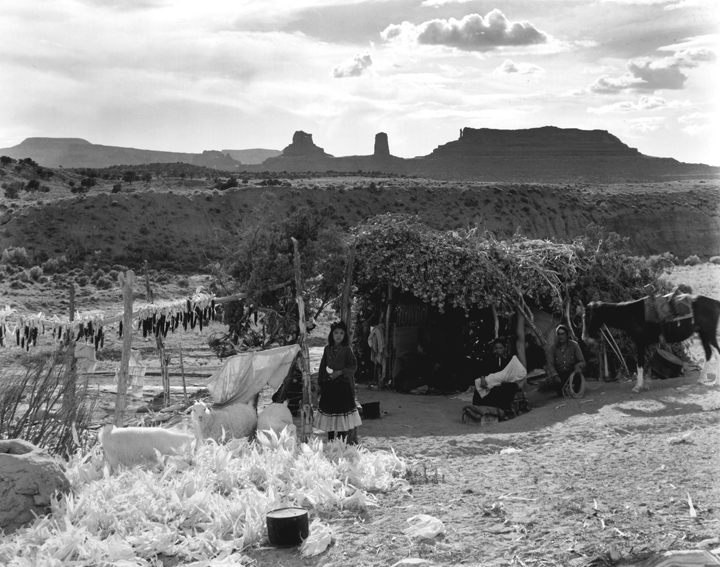 She focused her lens on the American life she came to know living and working among the Pueblo and Navajo peoples. Gilpin’s Southwest is always a peopled landscape and not a wilderness untouched by human hands. In a field traditionally championed by men, Gilpin was one of the first women to capture the landscape of the West on film and to comment—through her imagery and in her writings—upon the interconnectedness between the environment and human activity. Hefting heavy camera equipment, she trekked great distances by foot, jeep, or plane to reach remote locations in pursuit of views, often flying dangerously low in airplanes to achieve her aerial shots. Unbounded by physical risks and societal restrictions, Gilpin pursued photography in the Southwest well into her 80s. Maria Martinez is one of the best-known indigenous artists of the 20th century. 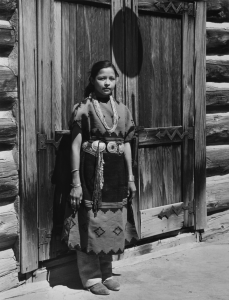 She belonged to the Tewa linguistic group and lived at San Ildefonso Pueblo, northwest of Santa Fe. Martinez is recognized internationally for the distinctive black-on-black pottery that she developed with her husband, Julian, based on the remains of ancient ceramics. In 1907 Edgar Lee Hewett, an archaeologist and the first director of the Museum of New Mexico (now the New Mexico Museum of Art), excavated shards of ancient Pueblo pottery at nearby Pajarito Plateau. 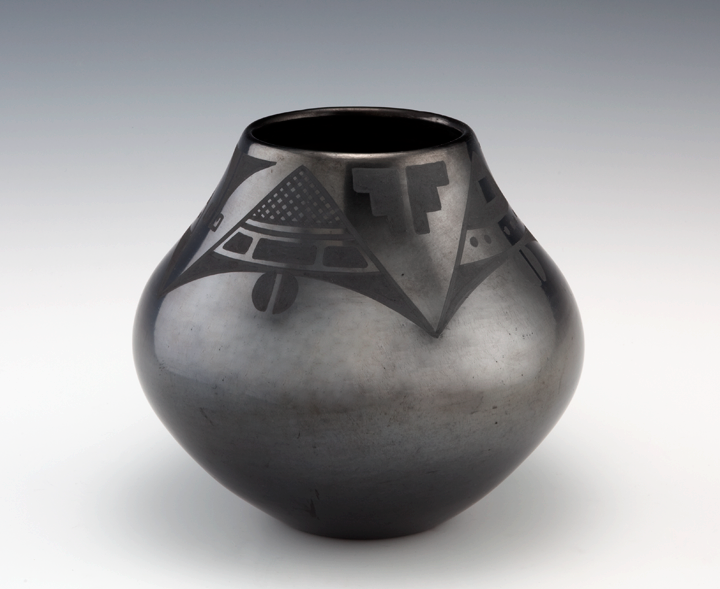 Hewett encouraged Maria and Julian Martinez to experiment with various firing and painting techniques in order to create contemporary versions of the artifacts. 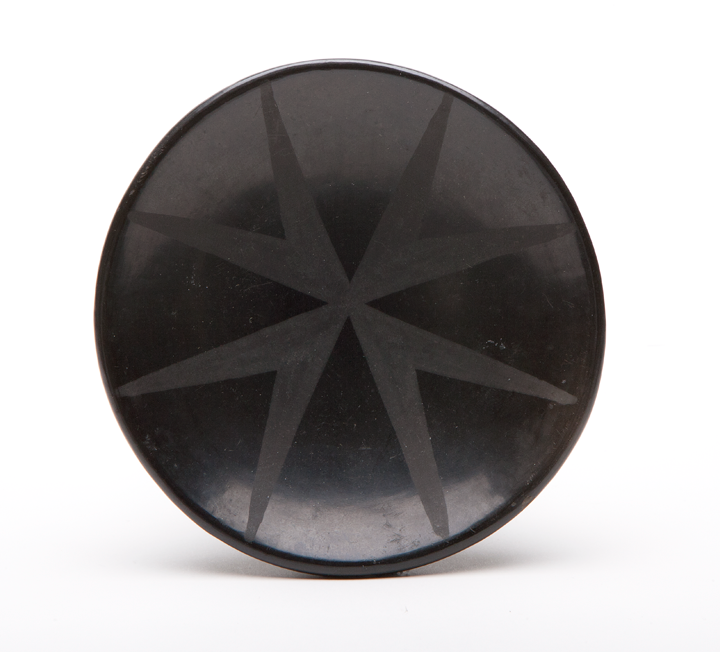 By 1921, the couple had mastered their process for making pottery with a highly glossed finish and matte-black designs. Maria Martinez learned the fundamentals of pottery making from her maternal aunt. Once the clay dug from the earth had been prepared, Martinez formed snake-like coils of clay that she pinched together to create the basic shape of the pot. She then scraped and smoothed the coils together until the pot was the same thickness all the way around. When it was dry enough to handle, a thin layer of slip (watery clay) was applied over the pot, and then the surface was polished using a smooth, fine-grained stone. Tewa prayers were said while digging the clay as well as during the firing process, thanking the Great Spirit and Mother Earth for the gift of the clay. The designs, initially made by Julian and later by other family members, were painted using slip applied with a brush to the burnished but unfired pot. Martinez’s pots quickly grew in popularity, and her work was celebrated at art shows, expositions, and fairs nationwide. Her pots were in such demand by the 1920s that she began signing her work—the first Pueblo potter to do so. The popularity of her work was related not only to its highly skilled construction, but also because it fit into the modernist aesthetic. Martinez went on to teach the process to members of her family and others in her community. Through her creative vision and craftsmanship, Martinez influenced generations of Native artists. She is recognized as a master artist, and her work is found in many major art museums.